Bangalore, India: The (Great) Indian Poetry Collective, 2016. The (Great) Indian Poetry Collective, founded by Minal Hajratwala, Ellen Kombiyil, and Shikha Malaviya has started a new “Emerging Poet’s Prize,” this year judged by the Indian poet Jeet Thayil. 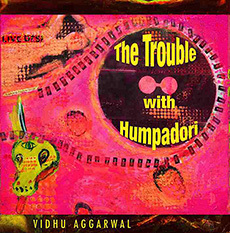 The selected three manuscripts for print include Vidhu Aggarwal’s debut collection, The Trouble With Humpadori. You can watch the trailer here. Don’t try to understand every nuance of Humpadori’s shifting ontology; rather, glide with them as they skitter across English and Hindi in a Gravitron motion that will leave you breathless, gasping at the texture of tongues and language. In this way the speaker, Humpadori, exists in the cross-sections as an entity complicated and queer, a palimpsest of subject positions that challenge colonial tactics that seek to define and rule. The “desi” references Wordsworth (“I wandered lonely as a cloud … ”) and ends in an explosion of the speaker’s first person’s multiple identities — a postcolonial, queer, Humpadori truth.